I have a tendency to pack light on my way somewhere and then buy too much stuff and not be able to fit it all in my luggage on my way back. I've learned to combat this in several ways. One of them is to pack an extra bag, like a tote, that I can use to put overflow on the way home. Another way, which I thinks is genius is to pack a set of Space Bags with me. 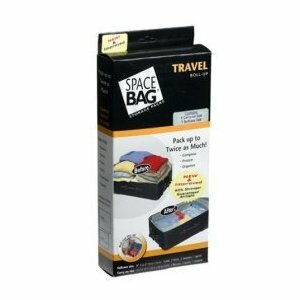 From the first I heard of Space Bag, I was totally hooked on the idea and have bought them for my house, for packing and keeping my sheets fresh in my linen closet. There are so many more things you can use them for, but my favorite is packing! You've seen me packing them for my Hawaii trip, but Space Bag was awesome enough to notice and asked me to officially review them and do a giveaway! Like I'm going to say no to that! Now, I like to use my Space Bags to their best capacity. Obviously, you could use two to do the same job and they will be smaller when you push out the air and even use them to sandwich breakable items in between, which I have done when bringing back bottles of wine and checking my bags. Here you will see the items I picked to bring on a weeklong vacation for just me. 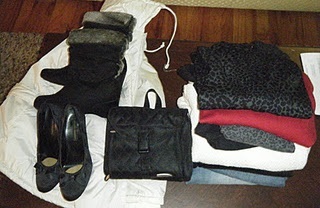 4 sweaters, a blazer, a little black dress, 2 pairs of jeans, a jacket, my toiletry bag and 2 pairs of shoes. Now, this is just for show, because you already know I would never pack a jacket or a second pair of shoes, but I wanted to give you an idea of what you could pack, even if you overpacked, in a carry-on with the help of Space Bag. Look at the pile and see how well it doesn't fit in my carry-on. Bummer. I could take it all, if I didn't want to bring shoes or my toiletries! So, at this point I employed my Space Bags. I used one carry-on size and one suitcase size. 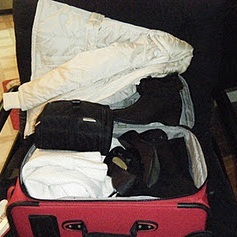 I packed all the clothing into the suitcase size and the coat into the carry-on size. The larger size is perfect, because it fits right into the bottom of the bag with no space wasted. Now, with the Space Bag, I was able to get everything in the bag that I planned to take. Now my pile is almost half the size it was originally! There would have been a bit MORE room if I had cinched the straps tighter. Look how well it all fits now, even just tossing my shoes in willy nilly. As you can see, I was able to scrunch my clothing down about a third, allowing me to get everything in the bag that I wanted to take. I'll be nice and warm at my destination and look great, too! If you pack less in your Space Bag and use multiples, it is possible to cut your volume by half. Think of all the other stuff you could pack in that space! Maybe you plan to bring some small gifts with you, or you want to buy a few souvenirs. Those would fit! Even I have free space in between my shoes and toiletry bag where I could add items. Just imagine the possibilities! There are my Space Bags and other zipper bags on the left from my last trip's essentials! These also make great gifts for the traveler on your holiday list. 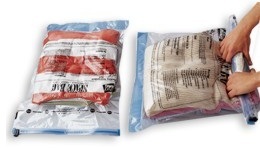 If you want to buy your own set or more, you can get them and learn more about Space Bag by visiting their website. I always pack too many clothes! Thanks!